Jeff Shooman focuses his practice on the representation of management in employment law disputes. 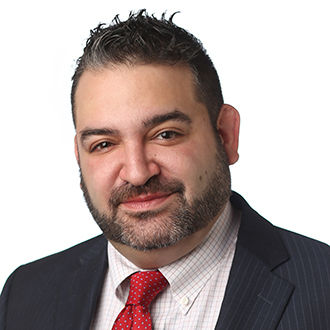 He is a seasoned litigator and has represented clients from various industries including restaurants, healthcare, and transportation, as well as public sector entities at the trial and appellate levels at both state and federal court. Jeff has experience litigating False Claims Act cases. He has actively litigated cases in federal court including a case that wound up before the U.S. Supreme Court. In 2017, the Supreme Court of New Jersey appointed Jeff to serve on the District Ethics Committee for Hudson County, District VI, for a four-year term. Prior to joining FordHarrison, Jeff served as a partner in a New Jersey-based boutique firm focusing on complex litigation. He also led the firm's appellate practice. Earlier in his career, he served as law clerk to the Honorable Esther Salas in the U.S. District Court for the District of New Jersey. During law school, Jeff served as a Senior Editor of the Seton Hall Law Review and published The Speech of Public Employees Outside the Workplace: Towards a New Framework, 36 Seton Hall L. Rev. 1341 (2006). At graduation, he was awarded the Raymond Del Tufo Award for having the highest GPA in Constitutional Law in his class. Represented public entity in a bench trial in a case of public importance. Obtained judgment for the public entity. Successfully argued appeal upholding the judgment. Represented attorney in malpractice action and successfully briefed cross-appeal in the U.S. Court of Appeals for the Second Circuit. Represented public entity in class action. Obtained summary judgment on behalf of the public entity and successfully defended the judgment on appeal.